With Brute force : O(n^2) calculations (exactly (N-1)*N/2 actually), roughly 125k force calculations for N=500. With Barnes-Hut tree calcualtions, it'll be O(nlogn). With a low number of bodies N < 50 or so, a slightly streamlined brute force is more efficient than a Barnes-Hut tree, but as N increases, the efficiency increases dramatically: Barnes Hut is an approximation which uses a variable theta to determine the ratio of distance to cell at which to use center of mass instead of step inside the cell. With a Theta = 0.5, we get roughly 50% gain for N < 500, 80% for N < 1000, reaching up to 90% beyond. With 10k bodies it takes around 0.5~0.8 seconds to compute a step, and 0.1-0.3 seconds to display it on the canvas. Brute-force calculation O(n^2) for all bodies. Real-time for roughly N < 500 Barnes-Hut calculation implemented and working. Real-time for N > 1k etc. Efficiency information is shown in real-time to the right of the canvas. 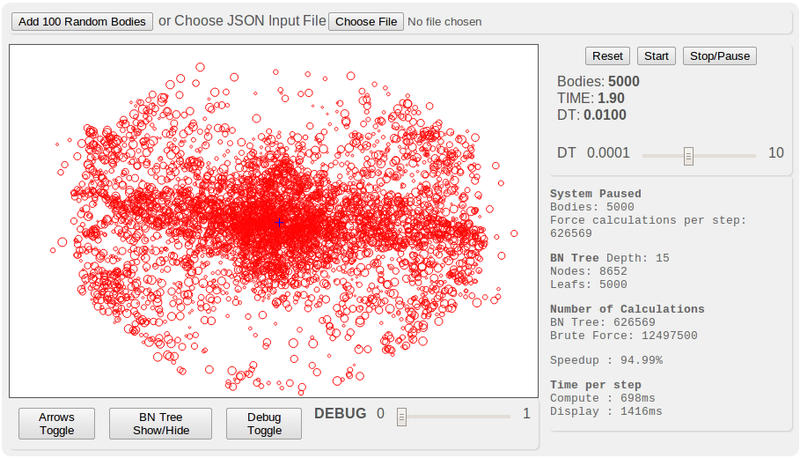 Following examples testing with Theta=1 (not accurate) Example with 1,000 bodies.